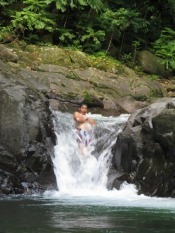 Sixteen Months in Dominica: To love Dominica, or not to love Dominica? The other day I went on a hike to Bense pool, about a half hour drive north of Portsmouth. 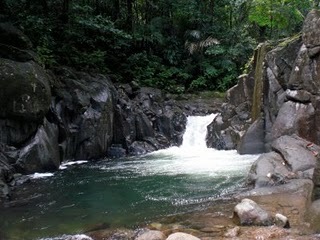 It's a natural pool, created at the bottom of a very small waterfall, near a fork in the river. The walk is not long: about an hour in on a soft slope downhill, and maybe twenty minutes on a steep climb back up (Vancouverites, think Grouse Grind). It was the first hike I'd been on in Dominica, and since I've been here about ten months now, I'm admittedly late to it, considering trips into the wilderness are one of the main appeals of this country. The day before I went, I spoke with Brandi Farid about the upcoming trip. "No wonder you hate Dominica," she said. "You haven't been on any hikes. 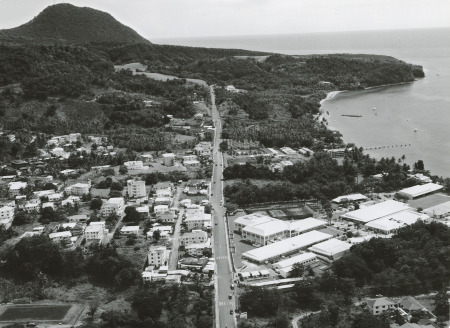 Portsmouth and Roseau are not Dominica. The real Dominica is up there." "I don't hate Dominica all the time," I replied. "Just most days." She's pretty astute, though. All the experiences I've gained here, from managing Island Thrift, to working at the Prep School, to volunteering at Calls, to playing hockey with fellow expats, have exposed me to a pretty diverse display of the people in this country. But aesthetically, I've stayed along the coast, amongst the litter, burning garbage, stray dogs, and foul smells. The hike was lovely, and short. I'm sure it's one of the easier trips on the island, and I'm certain I'll go on others that are better and more difficult. The pool itself was deep, cool, and clean. Off of a steep rock we each jumped, perhaps five meters up, into the water. The river that feeds into the pool also creates a natural water slide that you can go down for maybe fifteen feet before splashing into the pool. It's like nature's slip n' slide. The entire area is charming. This rando is brought to you by the Ross Wellness Club. Our guide was kind enough to show us the various plants along the way: cinnamon trees, breadfruit, pineapple, mango, coco, papaya, bay leaves, as well some tree gum that is extremely flammable, and some that is almost like actual chewing gum. Along the steep path back to the van, we were discussing the different islands, and our guide commented that you'll be hard pressed to find nicer people than Dominicans. No one disagreed. The hike finished with an astounding view of the cloud covered, inland mountains. I often forget how large this country actually is. Perhaps Brandi is right. 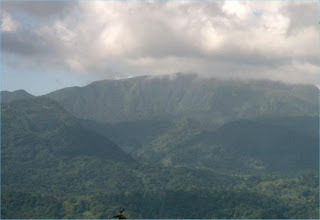 Perhaps the real Dominica is up in the mountains, where a great pride is taken in natural conservation. I'll have to go on more trips before I can reflect too much on it, but one thing is becoming increasingly clear to me: even though I am more and more homesick the longer I stay here, I am growing fonder of this place all the time, and will undoubtedly miss it when I leave. I feel tugged in many directions. Either way, this country gets under your skin. There is a simplicity here that I miss when I leave. The water in the pool was crisp: I've never seen or felt a river that clean. Our guide carried a young boy on his shoulders up a mountain without hesitation, and without complaint. This is a country unapologetically unlike any I have ever seen, and maybe that's why I switch back and forth between loving and hating it so easily. I'm interested to see how my feelings about this place change, the closer I get to leaving. Don't forget the ocean. The real Dominica is above and below sea level.